Inspired by Kazakh culture and traditions, the Iridium Spa is an oasis of timeless sophistication. Located on the third floor of The St. Regis Astana, and spanning 2,300 square meters, this transformative sanctuary boasts captivating views of Central Park and the Ishim River. Our expert therapists formulate bespoke rituals to fulfill each guest's individual needs, from deep-tissue massages and detoxifying facials to body wraps and customized spa packages. This refined experience begins with relaxing touches and continues with a holistic massage. You will enjoy a rejuvenating facial treatment as a final touch. Clarifying and deeply relaxing, this experience works on the concept of mindfulness, focusing on both mind and body to help de-stress and release physical or emotional anxieties. Through skillfully long stokes techniques and targeted massage to the feet, body and scalp, you emerge rebalanced, grounded and re-energized. Let go of deep tension, ease sore muscles and restore body and mind. Powerful specialized massage techniques target areas most in need of attention - releasing a stiff neck, aching lower back or tight shoulders. You emerge supple and re-energized. Relax… replenish... restore… with remarkable results. Tension is released, a busy anxious mind is quietened and the finest selection of high quality aromatherapy oils soothe on the face, ease or energize mind and body, depending on your needs especially on targeted area which is upper back. Ideal for those who find it difficult to unwind. This powerfully immersive treatment unites warm Essential Oils and sweeping movements by the expert hands of two therapists in a unique four-handed body massage. Deep-seated muscle tension is relieved, emotions are rebalanced and the spirit is restored. The treatment combines Asian massage techniques with the use of herbal extracts to awaken the energy paths within the body. Brings mind and spirit into perfect balance. Leaves your skin soft and nourished. This seamless, deeply nourishing massage uses warm oil together with vigorous flowing movements to generate body heat and moisturize the skin. Thai massage is a dry massage using passive stretching and gentle pressure along energy lines, contributing to a sense of ease and well-being. Stimulates and release tense muscles, reduces stress, improves circulation, increases energy and flexibility. This therapeutic full body massage is a powerfully immersive treatment that unites warm Essential Oils and hot volcanic stones. Using long and sweeping movements allowing the therapist to work deep into the tissues below the skin. Completely healing and deeply relaxing. Deeply revitalizing, stimulating and relaxing treatment, designed to purify the body, soothe tired muscles, and firm the skin. Nourishing and re-mineralizing body wrap with natural volcanic clay for complete replenishment. The skin instantly regains natural strength and radiance. Body polish with coconut oil, honey, and micro-fine rice powder. Gently exfoliates and removes impurities from clogged pores without stripping the skin of its natural oils. Leaves skin bright and smooth. Our invigorating ‘Dead Sea Salt' body scrub infused with healing ingredients cleanses your skin-dulling cells leaving skin intensively smoothed and deeply hydrated. It's the perfect prep to maximize results of other body treatments. Dry body brushing to prepare the skin for gentle exfoliation enriched with nurturing essential oils, promotes deep replenishment of the skin. As a final touch - a soothing clay mask. This is the ultimate kick-start to any rejuvenating treatment, you'll instantly feel and see the results. The ultimate traditional Moroccan hammam. Starts with black Moroccan soap wash followed by Rhasoul clay mask cleanse to smooth, hydrate, nourish the skin, and to clear, awaken the mind. Argan oils is applied to the skin in order to restore luminosity and banish muscular stress and tension. Restore skin's luminous beauty with this total body experience. Deeply cleansing, refining and nourishing, this experience incorporates a full body scrub with kesse, foam massage before finishing with a reawakening hair and scalp massage treatment. Beauty face treatment uses unique facial massage techniques for restoring facial muscles activity, promoting skin rejuvenation. Purify, hydrate, brighten and smooth your complexion with this moisturizing and awakening treatment. Restores the barrier function of the upper layer of the skin. Recommended for mature skin and for the skin with age spots. This luxurious balancing and oxygenating ritual is recommended for stressed, sagged or sensitive skin. Smoothing facial contours gives a radiant complexion immediately after the first procedure. For the skin which has a lipid deficit and is dehydrated. Ultra-moisturizing, regenerating, restoring facial treatment. Intensive care for sensitive skin around the eyes. Promotes better penetration of oxygen into tissues, fills the skin with active moisturizing elements for its comfort. Deep cleansing of the body and moisturizing massage, during which the upper layer of the skin is restored, making the skin protected against adverse climatic conditions (sun, wind, cold). The treatment combines relaxing lymph drainage massage and the influence of specially selected essential oils Huile Détente, Huile Sous-Ombilicale or Huile Jambes Lourdes. Helping to remove toxins from the skin, improve digestion and create relaxation. Perfect for tired feet and heavy legs, this targeted and revitalizing treatment helps reduce puffiness while soothing aches and pains. Start with our most renowned treatment - the ultimate face and back experience followed by the eye treatment which helps smooth and firm for a more youthful appearance. Continue your experience with nourishing Luxurious hand and feet treatment and relaxation tea in IRIDIUM atrium. Start to relax in a steam and sauna after a replenishing rice powder body exfoliation followed by bespoke full body harmonizing massage. Your journey will be finished with an exclusive brightening and hydrating facial treatment and healthy beverage in IRIDIUM atrium. Start to relax in a steam and sauna after a Dead Sea salt scrub polish in Hammam followed by relaxing Aromatherapy massage, continue your experience with foot reflexology and powerful facial treatment. Start with a welcoming foot ritual, followed by toning back massage or back scrub. Complete your journey with an Indian head massage. Express skin cleansing, light exfoliation with gentle face massage, followed by the application of a balancing mask. The ultimate touch a veil of light moisturizer. This is our most renowned treatment - the ultimate face and back experience, uniting targeted massage techniques with the purest aromatherapy oils and a highly-personalized results-focused back facial. Concentrating on pressure points along the feet, this traditional Chinese medicine-inspired treatment revives weary feet while also reinvigorating the spirit. This exclusive experience begins with a luxurious refreshing Glow Hammam, seamlessly continued by our signature rejuvenating Indian oil massage. Complete your journey together, with facial treatment and tea ceremony in a private Jacuzzi room. More than three hours escape with your loved one will start from replenishing rice powder body exfoliation in hammam followed by our signature IRIS massage and foot reflexology treatment and after you will enjoy one hour together in private Jacuzzi room with steam bath and tea ceremony. An unforgettable 20 minutes aromatic and therapeutic scalp and shoulder massage with a moisturizing hair oil treatment. A deep tension relieving massage concentrating on the back, neck and shoulder. A warm coating of moisturizing paraffin soothes and softens the skin. This advance eye treatment targets fine lines and wrinkles around the delicate eye area. Helps smooth and firm for a more youthful appearance. 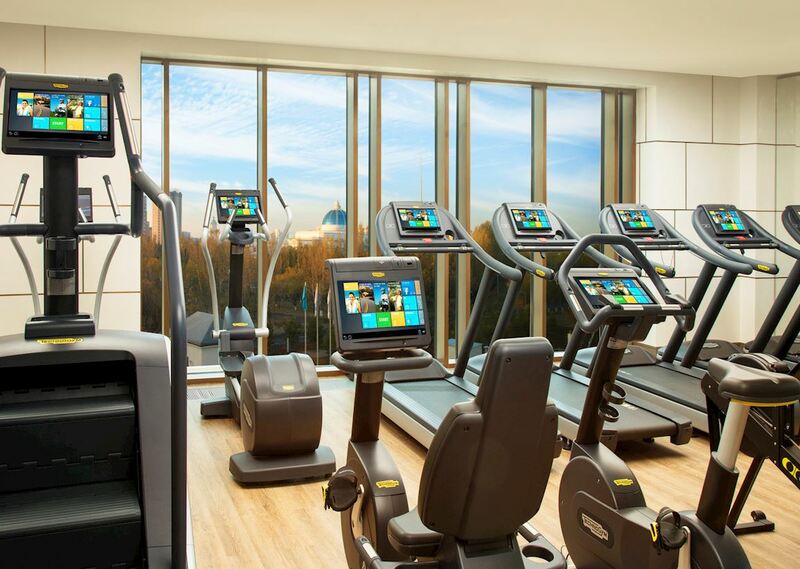 The St. Regis Athletic Club Located on the third floor and revealing inspiring views of Central Park and Ishim River, our 24-hour fitness facility houses state-of-the-art cardio equipment for an energizing workout, including the newest line of ARTIS® equipment and OMNIA™ by Technogym, individual TVs, ARKE™ Gym Equipment and exercise mats. Available upon request, personal trainers provide cross-training, yoga, stretching instruction, and more. Sessions are a minimum of one hour, for a supplementary fee, and must be arranged 24 hours in advance at the spa reception desk. Separate men and women's locker rooms, indoor pool, steam rooms, and saunas are available during spa hours. Hammam at Iridium Spa Astana For many centuries, Hammam has been a part of Turkish and Moroccan bathing culture. 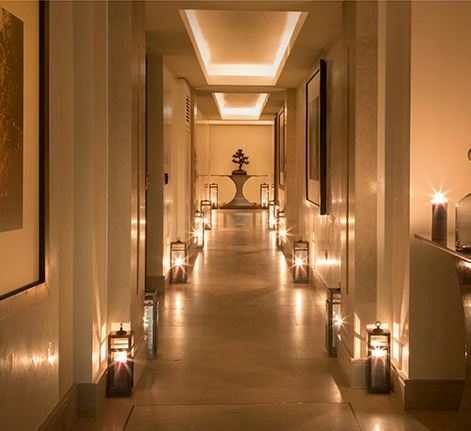 Not only a heaven for cleansing, hammam combines socialising with family and friends with a deeply relaxing experience. 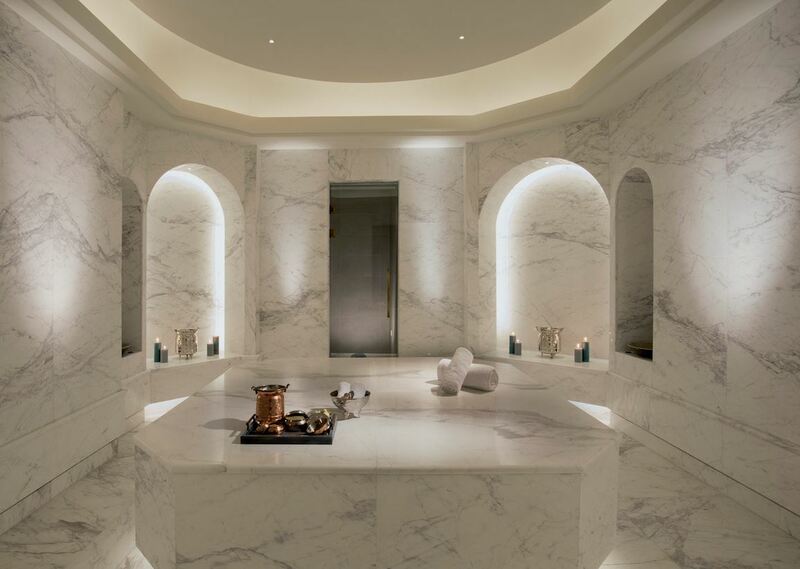 Encased in swirling cream marble, our expansive hammam - traditional Turkish bath - forms a sumptuous retreat for the guests of Iridium Spa. Encased in swirling cream marble, our expansive hammam - traditional Turkish bath - forms a sumptuous retreat for the guests of Iridium Spa. Indoor Swimming Pool Located on the third floor within the Iridium Spa and spanning 117 square meters, our heated indoor pool offers a visionary oasis. 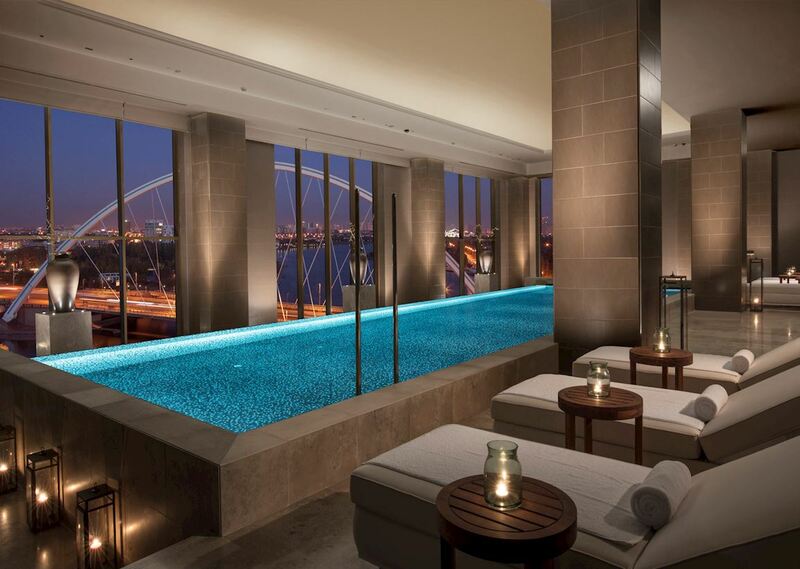 Floor-to-ceiling windows offer breathtaking views of the Ishim River and Astana skyline. Jura Grey limestone harmonizes with mosaic tile while marble plinths showcase local artwork. Our indoor deck is perfect for a poolside respite. During the summer, our outdoor terrace, replete with loungers and coffee tables, is perfect for sunbathing while admiring the unfettered views. Indulge in a tantalizing array of healthy refreshments from our spa dining menu, including soups, smoothies, and teas made with fresh, organic ingredients.